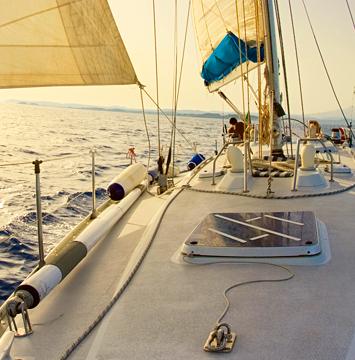 Plascore’s commitment to the marine industry is evident in our wide range of honeycomb cores, Plascore Board and assemblies engineered to meet the unique demands of naval architects and design and manufacturing engineers. From high performance off-shore racers to the recreational runabout, Plascore honeycomb marine composite products offer superior strength-to-weight ratios, toughness, moisture and corrosion resistance for even the most demanding applications. These critical qualities are desirable for hulls, decks, bulkheads, stringers, bunks, covers, hatches and more. Low density options matched with superior mechanical properties make Plascore marine honeycomb core products more desirable than traditional balsa and foam products. Providing high strength and stiffness characteristics during normal loading conditions, the shear failure mode of the honeycomb allows it to continue to function after its yield strength has been exceeded. Unlike some competitive core materials, immediate loss of function does not occur. Whether you need high performance Nomex® , Kevlar®, Aluminum or the popular, user-friendly PP Honeycomb, Plascore can provide the honeycomb solution that delivers maximum performance and value for your application.